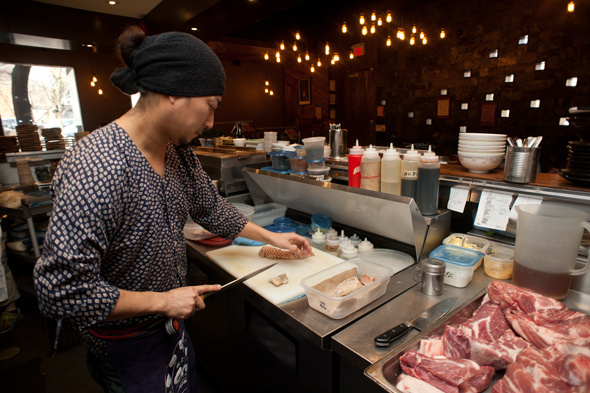 With the Sakura festival fast approaching, Chef Masaru Ogasawara shows me the cherry blossom branches that will fill two of Toronto's most consistently packed restaurants: Guu Izakaya and its Annex sibling Guu Sakabar. Ogasawara is a friendly, energetic chef who waves his arms around as he tells me stories about his childhood in Japan, his former life on the West coast and the push to open the third Guu Toronto location by the end of this year. Actually, no. My mom was a cooking teacher at our house and my dad used to own an Italian restaurant in Japan. So when I was young I hated the food industry. I liked to eat, I liked to cook, but sometimes I just hated my parents' jobs. And I wanted to see other industries. I worked at the Gap for seven years in Japan, then I was planning to come to Canada. And after that, I changed my mind, and I decided to become a chef. It's good, now that I've become a chef. I'm enjoying my job. Dishwasher. Usually, we start as a dishwasher in Japan, and sometimes - especially in sushi restaurants - it takes a long time to move up. Sometimes it takes ten years to be a chef at a sushi restaurant. But I didn't like that it took so long, so I chose an izakaya style. In Japan. Yokohama, which is next to Tokyo. And then I lived in Vancouver for five years. 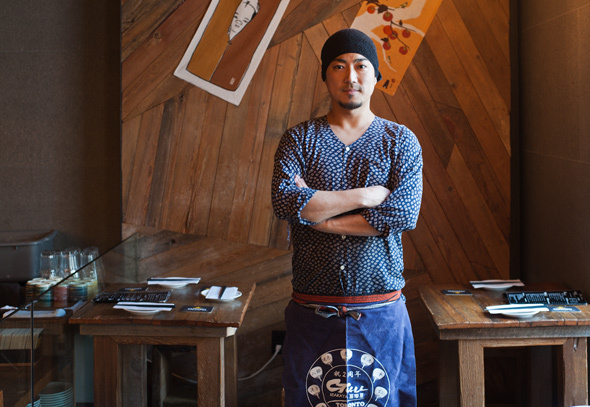 You moved from Vancouver to start up Guu in Toronto. Are you happier on the East or West coast? It's pretty hard to say. A lot of my friends live in Vancouver and sometimes I miss them. I just came to Toronto to open up Guu. So I don't have many friends in Toronto and usually I'm just working. The restaurant is so busy and now I'm taking care of two locations, so it's not easy. The West is much more relaxing, but I like Toronto as well. Business-wise, it's pretty good. There are a lot of opportunities in Toronto, so I want to expand. Why did it take so long for a real izakaya to open in Toronto? I'm not sure. Before I came here, everyone was telling me: "You should go to Toronto! You should open up an izakaya!" They told me I would be successful. But nobody wanted to move to Toronto, everybody stayed on the West Coast. But these days, people want to move to the East coast, especially Vancouver guys who know our success. Some of them will move to Toronto soon and more Japanese restaurants will open in Toronto. How many Guus do you think Toronto can support? More than Vancouver I hope. We are looking for a third one toward the north or downtown. So if we can get a good location, maybe we'll open up the third one by the end of this year or the beginning of next year. 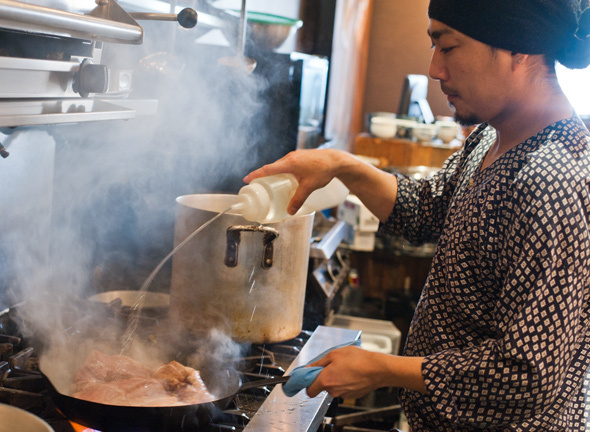 What dishes at Guu do you like making the most? The least? I like the daily specials. We always make the same stuff, so it's sometimes boring for myself and the staff. So we're always trying to make new dishes. I like to make everything. I even like dishwashing. We're working as a team, so each job is important. If I'm just doing one job, it's boring. So sometimes I'm dishwashing, sometimes cooking, bussing the dishes or bartending. What do you like to do in your free time when not working? I like biking. In Vancouver there's a lot more nature so it's more fun. I also like snowboarding, but there aren't a lot of good mountains in Toronto. And I like to go out to restaurants and research the Toronto market. Usually I go out with my girlfriend. Sometimes I come to Guu too, even on my day off. David Chang or Daniel Boulud? I'm pretty interested in Momofuku coming to Toronto. What's one food trend that needs to end? I'd like to see smaller portions, more tapas style. Sushi on Bloor or New Generation? Their sushi isn't sushi for me. I like Sushi Kaji. Best sushi in Toronto. Nick Auf Der Mauer, Porchetta & Co.